Solutia Openvision presupune implementarea cerintelor functionale ale clientului pe platforma open source Sugar CRM. Scopul acestui document este acela de a lista componentele cheie ale solutiei propuse si de a concluziona care versiune a Sugar CRM va fi folosita. 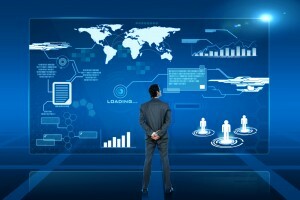 Sugar CRM este nucleul principal folosit de Openvision pentru a livra solutii avansate de Business Intelligence dedicate imbunatatirii proceselor economice. 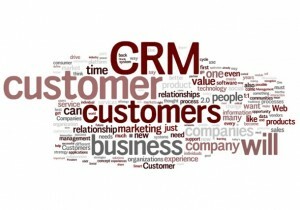 Sistemul CRM (Customer Relationship Management) ajuta companiile sa-si alinieze departamentele de marketing, vanzari, suport si management executiv oferind uneltele necesare in desfasurarea activitatii pentru fiecare departament in parte. Automatizarea departamentului de Marketing consta in posibilitatea angajatilor de a crea si trimite campanii email-based pentru a urmari posibili clienti care apoi vor fi incredintati reprezentantilor de vanzari. Modulul de campanii contine de asemenea unelte de captare a lead-urilor direct din website-ul corporate. Cresterea performantelor departamentului de vanzari prin simplificarea procesului de gestionare a clientilor/partenerilor. Acces rapid la informatii despre oportunitati si calculul automat al profitului adus de acestea, impartit pe semestre financiare: Q1, Q2, Q3, Q4. Folosind solutia noastra, companiile au siguranta ca problemele intampinate de clientii acestora vor fi tratate rapid si eficient. Modulul de suport clienti centralizeaza problemele semnalate de clienti prin toate canalele de comunicare si ofera posibilitatea creerii de grupuri email sau, mai mult de atat, posibilitatea clientului de a interactiona cu un portal self-service. Modulul de rapoarte transforma datele in obiecte interpretabile. Managerii pot monitoriza performantele afacerii la nivel global folosind diferite unelte: marketing analytics, sales trends, case reports. Fiecare are posiblitatea de a-si personaliza propriul mod de citire a informatiei. Toate departamentele unei companii au posibilitatea de a interactiona in cadrul sistemului si de asemenea pot avea un spatiu comun de document management sau wiki. Capabilitatile acestei plaforme permit administratorilor sa editeze layout-ul fiecarui modul in parte. Se pot scoate sau adauga campuri noi, relationarea acestora cu baza de date realizandu-se automat in cadrul sistemului. Utilizatorii avansati ai sistemului pot crea rapoarte fara a avea nevoie de cunostinte de programare. 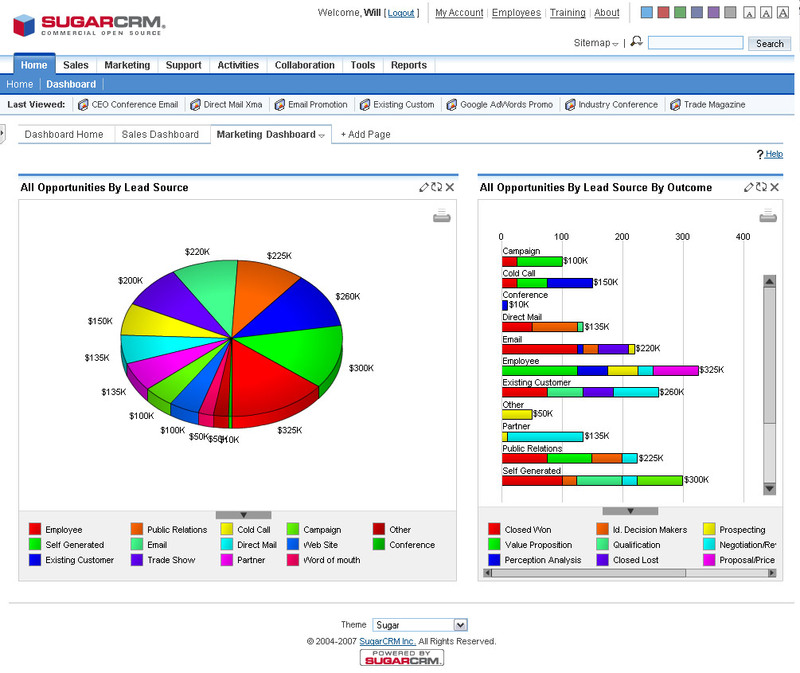 SugarCRM’s award-winning Sugar offers a single system of truth for managing customer interactions across different lines of business. Learn more about Sugar sales force automation, marketing automation, customer support and reporting capabilities. See how we support these critical business processes with collaboration and platform capabilities to meet the individual demands of your business. Sugar drives sales performance by allowing sales representative to track and share contacts and opportunities, manage and upsell into existing accounts, forecast revenue, monitor performance through dashboards, manage quotes and contracts, work offline through our mobile solutions and collaborate through integration with Microsoft Outlook and other groupware applications. Sugar Opportunity Management allows your team to close deals faster by sharing consistent sales information, tracking deal progress, and recording deal-related interactions. Customize Sugar to fit how your opportunity management process works, including sales methodologies, account details, and opportunity handling. Track and manage multiple opportunities through real-time reporting. View opportunities by team, product or geography in charts and then drill down to understand how the opportunity is progressing. Roll-up and analyze opportunities from across your organization. Understand how different units are performing and what improvements can be made. Ensure follow-through as opportunities progress across sales stages. Designate certain actions that need to be taken and automate reminders to ensure that teams and individuals take the necessary steps to close the sale. Adjust Sugar to fit your sales process. 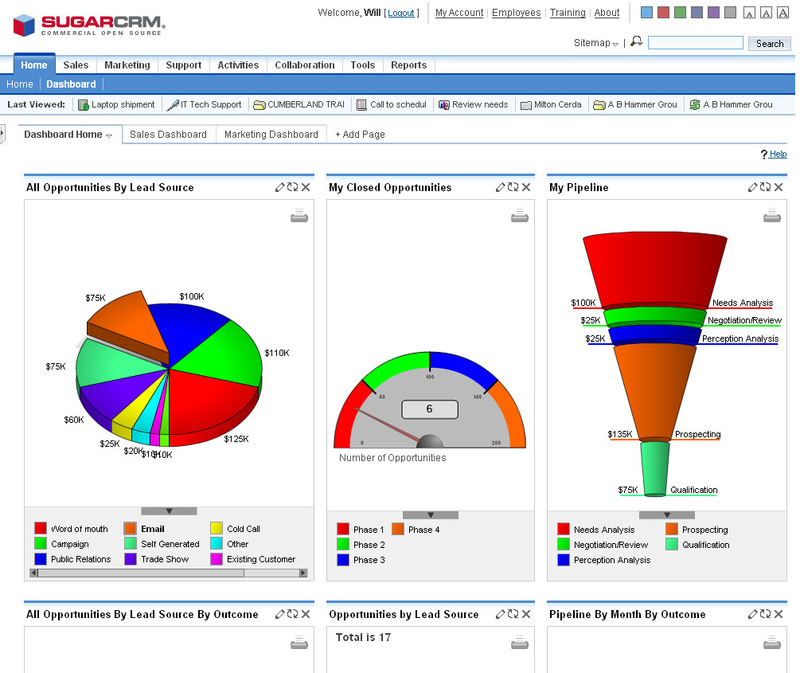 Customize the application to mirror how your organization tracks opportunities or download extensions from the SugarCRM community that track opportunities based on your industry and company size. Consolidates contacts into a single location and associates accounts with sales opportunities, account information and customer case information. Proven import and de-duplication technology ensures that companies have a clean, consistent view of customers and relationships. Merge similar records in a few simple steps. With record merge, companies can combines information from multiple records to create a single master, reducing duplicate contacts while increasing data cleanliness. Provides a single view of customers across products, geographies, account, and status. In one single page, users see not only account information, but all associated sales opportunities, contacts, activities, history, cases and quotes. Account management gives your organization the ability to build tighter, more profitable relationships by understanding the status of each account. View all information related to accounts, including contacts, interactions, campaigns, service request history, and other attributes. Define who in your organization owns the account relationship and who else is involved in selling or supporting the account. See who in your organization is interacting with the account before engaging. Understand if there are other marketing, sales or service interactions occurring with the account. Gives sales representatives and managers the ability to generate accurate forecasts based on sales data in SugarCRM. Managers can create, assign and edit quotas for their team, roll-up forecasts across individuals and teams, and measure forecast accuracy relative to commit amounts. Sales representatives can take advantage of scenario planning tools to generate high, medium and low forecasts, utilize worksheets to develop accurate commit amounts, and track their sales progress from the Sugar homepage. Generate more accurate forecasts with high, medium and low commit amounts to product a more complete view of future sales results. 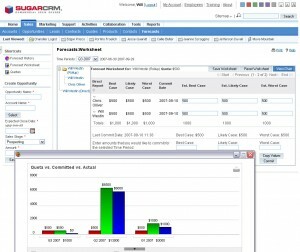 Leverage sales opportunity and sales stage information within Sugar to develop more meaningful and accurate sales forecasts. Consolidate sales forecasts from individuals, teams or divisions to gain a macro view of how company is performing relative to quota. With this functionality, sales reps can generate accurate quotes with support for multiple line items, currencies and tax codes. Quotes and contracts can be delivered to customers via email, Word or PDF. Strong version control functionality ensures reps can more easily manage multiple versions of quotes and contracts. Stay in touch while on-the-go with Sugar mobile functionality. Sugar offers wireless and PDA access that is hassle-free so you can continue to work away from the office. For our enterprise users, Offline Client Synchronization allows employees to work offline and automatically update Sugar when they return to the network. Sugar mobile solutions translate to less downtime and greater productivity. Provides employees and managers real-time information about leads, opportunities and accounts. Define access based on user profile and expose the information employees need to know to get their job done. Automatic consolidation of sales data from across teams reveals the information executives needs to drive performance across their business. See your personalized sales information on your Sugar homepage when you log-in each morning. Display multiple dashboards on your homepage in a variety of formats, including line, pie, bar, performance, scatter plot charts. Create accurate target lists based on Sugar reports or through importing third-party in lists. See information as it happens with real-time dashboards of sales performance. Share dashboards with team members to align goals. Investigate account progress and sales performance by viewing the account information contained within sales dashboards. Centralizes the development, execution and monitoring of campaigns across multiple channels. With Sugar campaign management, companies achieve better visibility into the effectiveness of marketing spend. Manage web media, email, newsletter subscriptions, webcasts, telesales, print advertising, TV and radio advertising. Track campaigns based on campaign type, account or industry so salespeople understand why customer responded. Define the information flow for the campaign so that the appropriate stakeholders can view and test the campaign before launch. Benchmark campaign effectiveness based on direct mail, phone, trade shows and email. Sugar allows marketing managers to identify the correct target for a given campaign, design offers that convey the brand identity of the organization, and track the response rates once a campaign is executed. Sugar’s Lead Management gives marketing professionals the tools to manage prospects and existing customers. Qualify and track leads from multiple campaigns and hand them off to the correct sales representative. Ensure prospects lists are valid and marketing offers are coordinated. With Sugar lead management, companies have the tools to populate the pipeline with more qualified leads. Close-the-loop between marketing and sales by automating the lead hand-off process. Design business rules to route the lead to the correct salesperson based on territory, team or specialty. Sugar Marketing Analytics allows companies to measure the effectiveness of marketing campaigns from the initial offer to a closed sales opportunity. Managers can assess the effectiveness of marketing campaigns relative to budget, channel, expected revenue and win rate to gain a full picture of how marketing programs impact the sales pipeline. Measure and prioritize channel campaigns based on lead source dashboards. Understand which campaigns generate positive returns with comprehensive return on investment (ROI) analysis for each campaign. Measure campaign effectiveness based on a variety of attributes, including leads created, new opportunities and closed-won deals. Acquiring new customers is much more expensive than selling to existing ones. With Sugar customer support, companies have the confidence that customer cases will be handled quickly and effectively. Sugar customer support centralizes customer service requests across channels to allow companies to manage inbound emails, diagnose bugs, share knowledge, and resolve customer issues. In addition, companies can defray customer support costs with the Customer Self-Service Portal. Sugar Case Management centralizes the service history of each customer, allowing for a detailed view of customer requests and responses. Case management metrics allow managers to monitor how cases are handled and to escalate issues to ensure customer satisfaction. Ensure sales and marketing understand the service status of each account to prevent surprises when calling upon the account. Route cases and their escalation status to the appropriate representatives to ensure timely resolution. Measure case metrics, including response time and customer satisfaction rates. SugarCRM Inbound Email processing allows support organizations to better manage customer support requests through information sharing and routing. With Inbound Email Processing, users can create rules for in-bound e-mails and automatically assign cases to the right customer support representative. The Sugar Knowledgebase helps customer support and engineering teams to better manage and share structured and unstructured information. Knowledgebase allows user to create frequently asked questions (FAQs), manage files, and search and rate content – all in an easy-to-use interface. Includes full support for the management of frequently asked questions (FAQs) and support for user’s ratings to prioritize the most useful information. Utilizes a Wiki-like user interface for managing simple, non-technical content, including posting, linking, editing and deleting content. Allows user to create, store and tag files for sharing and retrieval. Users can perform full text searches to find the information they need quickly. Effective service organizations resolve customer problems quickly and recycle feedback from customers into the next generation of product. With Sugar Bug Tracking, companies gain a complete view of product problems, their frequency and the effort needed to resolve the problem. Sugar bug tracking not only ensures that customer problems are solved, but that products are improved. Define the level of priority for any given incident. Assign higher proprieties for larger problems or more valuable customers. Track resolution times across accounts and representatives and define reminders to ensure bugs are handled quickly. Rank bugs to inform main customer problems and to inform future product direction. 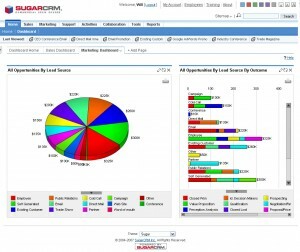 Sugar’s Customer Self-Service Portal allows companies to provide self-service capabilities to customers and prospects for key marketing, sales and support activities. Customers can create cases, upload relevant information, search the knowledgebase, and track cases to resolution without ever having to pick up a phone. All cases automatically appear within the Sugar Cases module. – Reduce the number of inbound support calls by offering a self-service environment. – Expose support knowledge to customers through FAQs and Knowledgebase. – Allow customers to update account information and manage newsletter subscriptions. Allows customers to update account, contact, billing and shipping address information in one single location. Customers can select and manage their subscriptions to newsletters and email lists which are automatically registered within the SugarCRM Campaigns module. Reduces the number of inbound support calls by allowing customers to search for resolutions within the Customer Self-Service Portal. The self-service portal also exposes the FAQ’s written and managed within Sugar. Sugar Reporting turns data into actionable information. Managers can monitor business performance across the entire business with reporting tools on Marketing Analytics, Sales Trends, Case Reports, and Customer Profiles. Dashboards can be customized to meet the individual roles of users or to track key metrics across the organization. Underlying each report is actual data, so managers can drill down and explore the data impacting their business. Sugar Dashboards provide employees and managers real-time information about leads, opportunities and accounts. Define access based on user profile and expose the information employees need to know to get their job done. Automatic consolidation of sales data from across teams reveals the information executives needs to drive performance across their business. Sugar Reporting gives sales managers the insight needed to adjust to changing business conditions. On one screen, sales managers can monitor the pipeline of sales representative by sales stage, view how many calls each rep has made over a given time period, and monitor closed and expected revenue for the quarter. Managers and reps can also take advantage of the strong reporting and charting capabilities to create personalized dashboards that update whenever information changes. Sugar Case Reports monitor customer problems and how well your customer support team is solving these issues. Case Reports can be used to measure open cases by time period, support representatives, priority and entitlement. With Sugar Case Reports, managers gain a better view into the satisfaction of its customers and the performance of the support organization. Sugar Reporting provides a better understanding of who your customers are. Reports and dashboards show customer profiles by industry, geography, company size, product assets, revenue and other important attributes. By gaining a better understanding of customers, companies can better manage existing relationships and build new ones. Underlying marketing, sales and support activities, Sugar Collaboration provides capabilities to manage email within Sugar while integrating with Microsoft Outlook, schedule and track activities, manage projects, and work in offline or mobile settings. Sugar collaboration streamlines common tasks and promotes more effective communication with employees and customers. – Manages upcoming tasks, open items, percentage completion, open cases, etc. – Capture important customers communications within Sugar. Sugar’s Activity Management streamlines the tasks necessary to get the job done. Manage e-mails, meetings, calendars and calls within a central location to ensure teams work together to close more opportunities in a shorter period of time. Sugar Platform capabilities allow administrators and developers to create powerful business processes quickly and easily. Administrators can define teams, control access rights to modules and fields, change the homepage layout or modify and existing screen with the layout editor, and create new dashlets from third-party data sources. Simple yet powerful workflow tools give user the ability to create and enforce business rules. Sugar offers the ability to create custom fields within a given module or create an entire new module with Module Builder. These new modules can be unique to your company or they can be shared or sold via Sugar Exchange and loaded into other Sugar instances through the Module Loader. Sugar Access Control levels allow information to be shared or restricted based on user role. Administrators can determine what information that role can access at either a module, view or field level. Access Control rights include the ability to access, view, edit, import or export. Sugar Workflow management streamlines critical business processes within your organization. Using Sugar templates, administrators can create custom business processes based on Sugar Objects. Users can also define alerts, actions and triggers to become a more responsive to customer demands. Custom Fields allow companies to capture information specific to their business within Sugar. By creating Custom Fields using Sugar Studio, administrators create fully upgradeable values that reflect information most important to the company. Administrators can also choose to require users to populate custom fields before a record is saved. The Sugar Module Builder enables users to build custom modules from scratch or combine existing or custom objects into a brand new CRM module. Developers can leverage existing Sugar Objects such as Contacts, Accounts, Documents, Cases and Opportunities to build a new module or create their own custom objects from scratch to form a new module. Users can build an unlimited number of custom modules, which interoperate seamlessly with Reporting, Workflow and Sugar Studio tools. Upgrades for custom modules are fully supported. The Sugar Community has developed hundreds of module extensions for Sugar. 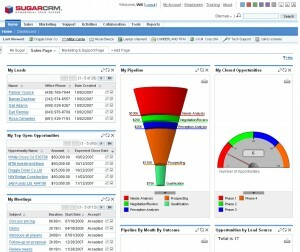 With Sugar Module Loader, companies can easily install these extensions into the Sugar application to get the most out of your CRM system. Using the Sugar Module Loader framework, administrators follow a simple process for installing new applications in a completely upgrade-safe environment. Sugar gives end users control over what information they see on their screens. Using drag-and-drop capabilities, users can change the layout of their homepage, hide unused dashlets or create new dashlets reflecting information important to the user. 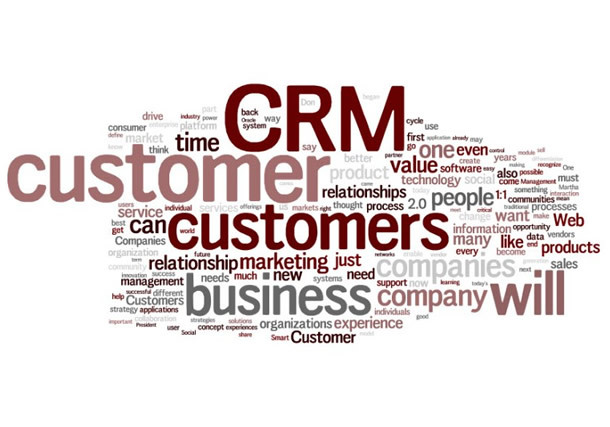 With Sugar, CRM becomes a little less staid and little more like a My Yahoo! page. Sugar Dashlets are highly configurable containers which display Sugar module data, along with external sources like RSS feeds and with web services like Google Maps. Sugar Dashlets is a powerful new way to combine highly functional mash-ups in an attractive and easily tailored AJAX-based UI framework. 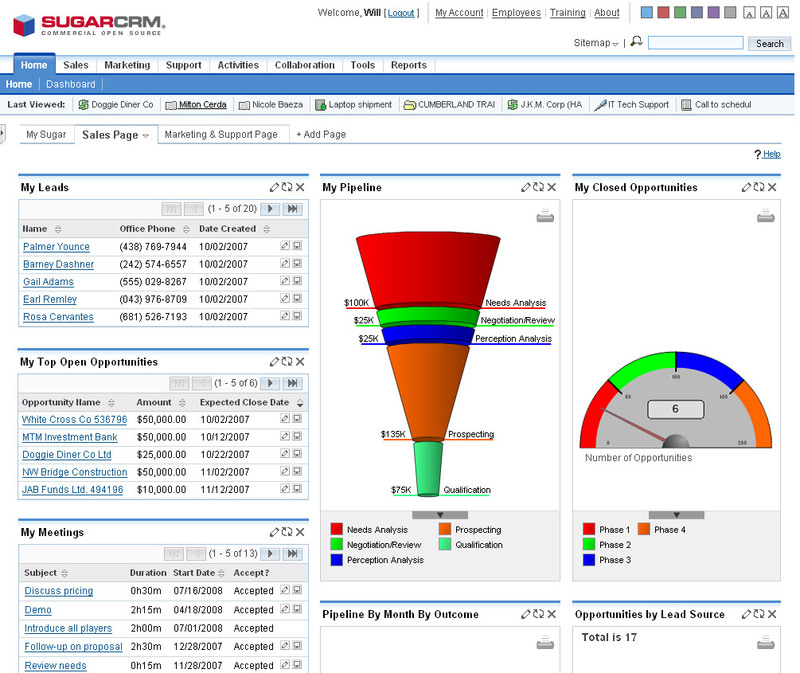 Sugar Exchange, the online marketplace for SugarCRM extensions, offers a wealth of extensions written by the Sugar Community. These Exchange Apps can be easily integrated into your Sugar instance through the Sugar Module Loader. Technical and non-technical users can author their own modules through Sugar Module Builder for sharing or sale on Sugar Exchange. Sugar’s Team Management allows companies to create and manage teams based on job type, division, geography or other attributes. Once roles are assigned, administrators can assign access rights to a given role to ensure team members have access. Team Management ensures more effective information sharing and better information about team performance. – Define teams based on company and customer needs. – Assign leads to teams based on expertise and existing relationships. – Analyze how teams are working together and identify potential gaps in performance. Assign leads to teams based on various attributes, including skill level, product expertise, or geography. Monitor the effectiveness of teams by leads generated, sales stage progression and quota attainment. Change your teams based on market needs and skill sets to pursue opportunities with the right team members.